When Fibi quit school, she quit dreaming about her future. Her sister had passed away, and Fibi focused on survival for the small children left in her care. But when she became the youngest member of the 31 Bits family, the strong, nurturing women there wrapped arms of love around Fibi, teaching her how to be a mother and how to dream again. Now, as Fibi provides medication and schooling for her children, she can invest in their future. And as she designs beautiful jewelry sold to women around the world, she dreams about her own future as well. Aspiring to open her own business someday, Fibi inspires others with her passion and story. 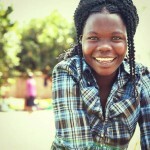 When you buy these beautiful products, you empower at-risk Ugandan women to overcome poverty and follow their dreams.